I want to share a story about pollution, and the excuses that are made to pretend that ignoring its existence will solve the problem. I moved to Galway, Ireland, for a spell when I was 25. (If I had my druthers, I would never have left! Ah, immigration!) I arrived on an amazing September day, walking through the center city, pondering how and where I was going to work, where I would live, and what music I would see first. My meanderings took me from Shop Street, to High Street, to Quay Street, the fresh Galway Bay air surrounding me, billowing clouds in the sky, a lighthearted stride and a new beginning. A walkway led along a tributary to Lough Corrib, which I was admiring, when I came across a fairly thick dam of rubbish – all sorts of plastic trash, a few sneakers, some chunky items I cannot recall – and my image of this beautiful and clean city came crashing down: This could not be the result of one, or even solely a few- days of filth tossed into a river, carried downstream and plugged by a dam that on wetter days would see the water carried over its top. Why was this there?! It’s a city sustained by tourism – doesn’t anyone care to keep up its image, at least? I decided that I was going to figure out what to do about it. I walked to the city’s administrative buildings, and spoke with the councilor for the local environment (my terms might be wrong, here, but the man was in charge of keeping the city clean.) I described what I had seen, and he said, “Sure, it’s not usually a problem! September has seen little rain, and most of the year the water carries all that rubbish into the Bay and out to sea!” We then had a discussion about how that wasn’t truly the solution to Galway’s rubbish issues, but I divined that there really wasn’t anyone employed to clean the Lough, and that was that. So I went to the University College Galway (now NUI) to see if I could borrow a fishing net with a long handle to scoop the stuff out. The professor I spoke with was somewhat skeptical of my endeavors, but allowed me to borrow the net, as long as I returned it by the end of the day. I took the net, bought some gloves and ten large black plastic bags, returned to the scene and got to work. I filled one, two, three, four black plastic bags, receiving stares and furtive quizzical looks all the while. When I was up to my eighth bag, a man, the one person who had briefly struck up conversation during my junk-fishing bonanza, had purchased more bags and brought them to me. I think I filled about twelve bags in all, and I actually began to find interesting the discarded crap in the nets. So where am I going with this? Today, as with many days this summer, quite a few this autumn and several already this winter, Cully’s air has been fouled with the stench of asphalt, mainly due to atmospheric inversion. On the days when the ground temperature is warmer than the air, it is less noticeable, so there is a better chance that the VOCs and other airborne toxics remain unnoticeable. There is no problem, right? The pollution heads skyward, dissipates, and is essentially non-existent – or at least harder to pinpoint. The same argument prevails, that, given the right conditions, pollution goes away. It’s not in our back yard, or in anyone’s back yard. It’s for the Earth to absorb or disperse. Portland is an unwilling recipient of toxics from China, Boardman, and other distant locations, all due to atmospheric conditions. All pollution ends up somewhere. In a twisted way, our toxic inversions are positive events as they alert people that there are truly problems with our air quality legislation – they can call, complain, get active in issues that affect everyone. People need clean air to survive. We can’t let industry or government continue to hide behind the guise of dissipation or loss of jobs. Call DEQ when you smell anything! It’s up to us. There is a great deal of focus on Particulate Matter, or PM, these days. PM is a pollutant that comes primarily from soot and smoke. Diesel trucks and aircraft are major sources of PM pollutants. The Cully, Sumner and Parkrose neighborhoods are affected by heavy diesel truck traffic, PDX airport, the rail lines and the 205 freeway. In addition to industrial polluters, these sources contribute large amounts of oil and diesel PM pollution to our neighborhoods. Especially during a temperature inversion, these exhaust and soot fumes can create a dangerous local airborne stink event. CAAT is teaming up with the Oregon Environmental Council-OEC, to create a monitoring project to determine diesel related PM pollution levels. This project will involve local community members taking measurements in the areas they frequent and walk through. It is an exciting opportunity to get involved and help the local airshed. 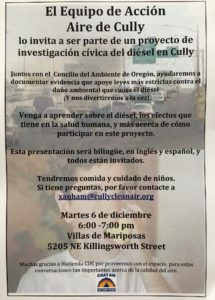 If you want to participate in this study please contact us and attend our next meeting. 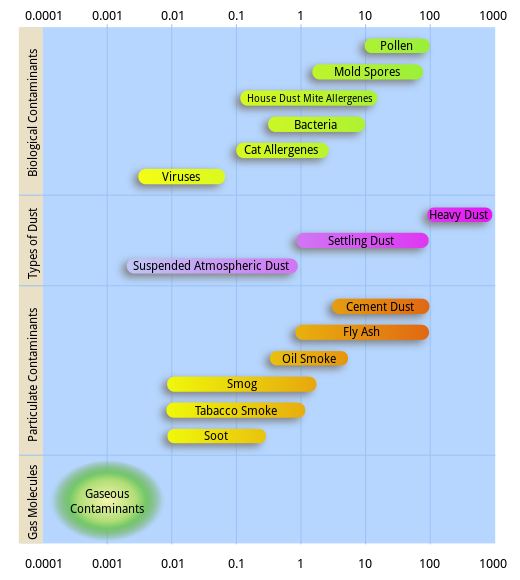 Particulate Matter is a pollutant where the size of the particle matters. This has to do with how our lungs function while breathing as absorbers of atmospheric oxygen. With smaller PM there is more penetration into sensitive lung tissue. But even the larger PMs can cause difficulties in our lungs, throats and nasal cavities. Premature mortality incidence is associated with this pollutant. Other PM-related health impacts include chronic bronchitis, non-fatal heart attacks, respiratory and cardiovascular illnesses. In the chart below you can see the how the sizes of PM are related along the top and bottom horizontals. Current areas of regulatory focus are on PM 2.5 (size in microns) and PM 10. While there are many kinds of PM, the ones of most import for air pollution monitoring and remedy are Black Carbon PMs. CAAT, OEC, Oregon DEQ and OHC are all beginning to work together to address these issues and to increase protective Oregon state regulations on diesel trucks. Currently Oregon has relatively lax laws regulating diesel trucks, much more permissive of pollutant and PM release than neighboring states. Oregon is far behind both California and Washington state in terms of upgrading diesel engines to meet healthy standards. Large trucking companies have taken advantage of that by dumping their dirtiest trucks here in our state. We will be working together in 2017 to find ways to reduce diesel pollution where it matters most for our health and our community. If you would like to be a part of this discussion please contact us and come to our next few meetings. 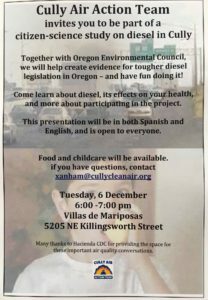 Portland, OR—The Oregon Department of Environmental Quality has sent letters to industrial facilities with DEQ air permits and registrations requesting reports on their usage of substances from a list of 633 chemicals. http://www.deq.state.or.us/aq/cao/docs/EI_Letter.p… The requested data will be used by state regulators and health experts to develop an effective health risk-based permitting program as part of Governor Brown’s Cleaner Air Oregon initiative. Using this information, the state will develop a more comprehensive inventory of air toxics emissions. The inventory will allow DEQ and the Oregon Health Authority to develop and implement a regulatory program that appropriately prioritizes efforts to control emissions to reduce potential risks to human health. The data will also provide the foundation for recommendations to the Oregon Environmental Quality Commission for which facilities should be subject to reporting, permitting, or other regulatory requirements. The list of chemicals that must be reported is based on a combination of the U.S. Environmental Protection Agency’s list of Hazardous Air Pollutants, as well lists from the Washington Department of Ecology and California Air Resources Board. With this information, DEQ will be able to determine the types of facilities using these chemicals, as well as the quantities typically used on-site. The chemicals reported will be compared with current scientific data to identify which ones pose health concerns and need to be brought into the new regulations. The letters have been sent to 1,298 facilities in Oregon. DEQ has created a website to assist facilities in gathering and reporting new data, http://www.deq.state.or.us/aq/cao.htm DEQ will propose draft air toxics rules to the Environmental Quality Commission in December of 2017 following an extensive public engagement process, including an analysis of the emissions data as well as the fiscal and economic effects of any proposed rules.